Keeping a pet at home is a huge responsibility. You can’t just one day bring them home and just forget about it. Taking care of the pet needs is similar to having a baby and the responsibilities related to it. Your pet needs your love, care and attention, just like a member of the family. It’s true that your pet has found a nice caring house for living, but it also necessary to create a nice cozy bed for it to relax and sleep in peace. This place should be its own personal space where they can enjoy their furniture. For making your adorable pet comfortable at home, you need to design a pet bed from recyclable materials that can be found inside homes. These materials can be anything from sweaters, old televisions, pallets, crates, etc. The DIY pet bed ideas that are shown here are interesting and give you an opportunity to have fun and be creative. If you have any spare round table that is lying around without any use, then it’s time you convert that to a pet bed. Cut a section from the round table and paint it in bright colors. Place a comfortable and soft cushion in the centre for your dog or cat to sit. Your innovative round pet bed idea is ready for your pet to explore and relax. If you are looking for not too expensive pet bedding, then the table per bed is just right. If you have any useless wood coffee table, then you can make use of it right away. With little bit of work and few tools you can create something very nice for your pet to relax. Turn over your coffee table and use a paint to touch up. Use a comfortable cushion to create a pet bed that looks very appealing. You can decorate it according to your liking or as per your pets liking. If you have any old suitcase that has been lying around with no use, then it is the best material to make a pet bed. Use screwdriver to remove the screws from the hinges that hold the top and bottom half of the suitcase. Join them with the double-sided studs that come with furniture. Mark a position at the bottom side of the suitcase with a marker. Drill a hole in the suitcase bottom and hold the furniture legs in place with a bolt. Ensure the legs are tightly placed and then place a cushion for your pet to sit. You must have seen a lot of pictures of cats lying near the computer monitor, but for owners this can be a nightmare with the amount of fur that will be there to be cleaned. To prevent this, why not create a computer monitor bed exclusively for cats. You can place this next to your desk, so both of you can be happy. Use an obsolete monitor and remove the wiring from the inside. Get this done from a professional because CRT monitors can hold huge amount of electricity even if they are off for a longtime. This charge can kill you if you are not aware of the internals of such equipments. Properly discharge the monitor and once you remove the wiring Place some newspaper and soft cushions inside the monitor. Color the exterior with some interesting colors so that it doesn’t look like a monitor. Your computer monitor bed is ready for use. If your pet needs a sofa for himself because he or she is growing old and can’t get onto the living room furniture, then build one for him. 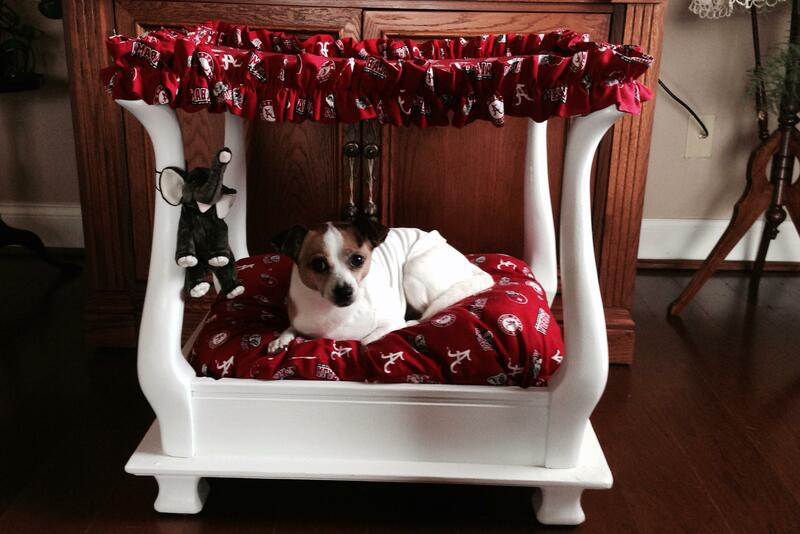 Use an old and upholstered sofa to create a nice and snug pet bed which can be put to use during the winter months. To make this comfortable pet bed, the legs of an old office chair were cut off. Furniture pads were added at the bottom to stabilize it. Then, the entire chair is covered in soft blanket and felt letters. This is a portable pet carrier and a pet bed when it is not carried around. It costs very less to make. The mesh top is removable so that the basket can be used for an outing or as a bed at home. Add a waterproof liner and add bedding scraps to the waterproof liner. Decorate the basket with a ribbon or paint the name of your pet over it. You can leave it as it is. This is a very simple project requiring very few materials and tools to complete. Furniture feet are screwed onto the base of an old dresser drawer and the whole unit is painted. Write the name of your pet at the front to indentify the new owner. The dresser drawer can be bought from a secondhand shop, cleaned and painted to make it look new. Add an inviting pillow inside the drawer to make it comfortable for your pet. 40 years ago octagon tables were quite a craze. Today you can find these at secondhand shops for nothing. You can convert his table into a pet bed by removing the front door and giving the whole piece a fresh new coat of paint. To make it usable for your pet, add to the insides some fabric and a cushion. There are many household items that can be reused to make it suitable for your pet to use as a bed. With some right supplies and creativity you can make a pet bed of your own. Make sure the cardboard box is sturdy and large enough to accommodate your pet. If you don’t have one at home, get them from a store. Reinforce the box with a duct tape to make it durable. Cut an opening for your pet. To make the interiors comfortable, add comfortable and warm bedding. Paint the exterior with nice colors and make it interesting for the pet.